We are excited to introduce our “TLC’s Top Tools” series. Here, we’ll give you the fast track insight from each of our top experts in their fields, who will give you key pointers on their favourite improvement tools. They’ll tell us why they like it, and where they’ve found it useful. We’ll cover classics like the ever-popular 5S, where many improvement journeys start, as well as more advanced tools like Statistical Process Control. Expect to be enlightened about topics like Value Stream Mapping, Visual Management, a behaviour modification tool called ABC BOC, and others – and if one of your pet topics isn’t included in the series, just let us know and we’ll add it. To launch the series, our expert facilitator, coach and mentor, Grant Davis shares his top tool, 5S. In the 1980’s the collective techniques being used in Japanese automobile manufacturing started to gain the world’s attention. Many incredible philosophies and doctrines started to help other businesses revolutionise the way they did business. 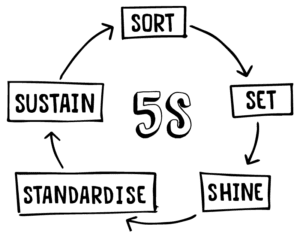 One of the most foundational business disciplines arising out of Lean thinking is 5S. Many companies applied the tools like 5S without understanding the philosophy and turned it in to simple housekeeping with a bonus of safety. They missed the mark. The original intention by Mr Hiroyuki Hirano when developed with Toyota, was to form the foundation of an operating system rooted in discipline and a new structured way of thinking. Sort – Declutter by removing what you don’t need or use. Set – Take what is left and necessary and lay it out in a logical way with the most frequently used items closest to you and least frequently used tools further away. Shine – Clean or make visually appealing using colours to highlight key elements and make the process visible. Standardise – Find the best practice and make sure everyone works in that single best way. Sustain – Drive it by continuously monitoring and seeking the best solutions to standardise. 2. When would you use it? What problem will it help you solve? The 5S’ work right along-side other foundational disciplines such as standardised work, visual workplace etc. I believe it can be used for innovation and improvement, culture change and increasing people engagement. It is simple for anyone to understand but also scalable to drive more in-depth application as people grow in their understanding. It builds a culture of discipline at first and unites everyone in a common improvement language. Then almost without knowing it, a foundation for more advanced techniques has been laid. For example, visual work, visual management, flow, defect management, production management, standardised work and – don’t forget – it is providing a mechanism to empower staff to innovate in a structured way. 3. Can you give examples where you used it and what the benefits were? The best implementation approach I have used so far is to train the entire company with short 5S overview workshops and start a competition between different departments in the factory. We use an audit sheet with specific requirements for each “S” step to achieve a score used to compete against other departments’ scores. This is not a strict audit but we use it more as an opportunity to coach and engage. We fundamentally changed the standard “money-voucher” type rewards approach for the initiative where instead our aim was to instil pride in the work your people do by rewarding with meaningful workplace improvements that staff have been asking after for years. This drives engagement and empowerment of staff because they have personally worked for and earned a major improvement in their work space. People may request a monetary reward at first but be firm on this principle. At first you will get some resistance, but when other departments see their colleagues getting new faster computers or comfortable chairs, or better lighting, ventilation, or new equipment or machinery in a factory, they will see the value. They are empowered to enhance their work life which essentially begins to foster pride in the work they do. Oh, and by the way, you will also have productivity, efficiency and quality gains partly because of the methodology but mostly because of creating happier, engaged and innovative teams. 4. Why do you like this particular tool? It has the power to transform any business and improve the work environment with engaged and motivated staff. It forms both the foundation for and the gateway to many other Lean or Operational Excellence tools. 5. What advice would you give to others thinking about using it? Make sure you take the time to understand the true philosophy and understanding first. Then transfer your passion and energy to your staff. Create a simple, one-worded and catchy campaign and a meaningful rewards system. These rewards need to be carefully designed to re-instil pride in the work people do. Big bang team buildings are good but short lived and rarely have lasting impact. Something like this engages, motivates and builds high-performing self-driven teams. Thirty minutes of exercise every day is worth more than a month’s exercise once a year. Grant is TLC’s Business Improvement Manager and joined TLC in 2011. Grant is a highly experienced trainer and facilitator. He has trained and coached over 1 900 people on Lean Six Sigma Black Belt, Green Belt, Yellow Belt, Lean, Design for Six Sigma and Process Management. Grant has facilitated process improvement workshops for top companies, mapping and analyzing thousands of processes. His industry experience includes Finance, Insurance, Banking, Manufacturing, Logistics, Oil, Aviation, Agriculture, Education, Textile, Energy and Telecommunications.